For years the Boulevardier languished in dormancy while drinkers reached for Negronis, Martinis and Manhattans. Yet the drink that was once a toast to Paris’s Jazz Age is now here to stay, writes Jake Emen. Take a Negroni, a drink which – perhaps more so than any other – is the Platonic ideal of a perfect cocktail, swap out its gin for Bourbon, and boom, the Boulevardier is born. The Negroni was unleashed on the world in 1919, and within a decade, the Boulevardier graced us with its presence as well. The use of whisky alters the balancing point for the drink, achieving a rich, dark sultriness in place of the bright botanicals and crisp cleanness of the Negroni. ‘The Boulevardier is a complex drink, full of body and texture,’ says Mariantonietta Varamo, assistant restaurant and bar manager at GBR London in Dukes Hotel. Varamo shifted roles to GBR after a six-year stint alongside Alessandro Palazzi at Dukes Bar. Stir the ingredients together over ice, then strain into a coupe glass. Garnish with your choice of an orange or lemon twist, expressing the peel over the glass. The Boulevardier’s origins are simple enough, though taking a bit of a circuitous journey to explore its roots is a worthwhile endeavour. The drink makes its first known appearance in the 1927 book Barflies and Cocktails from Harry McElhone, the raconteur proprietor of Harry’s New York Bar in Paris. McElhone’s book includes recipes, toasts and extensive ‘bar life’ instructions, with much space devoted to an organisation dubbed the IBF, or ‘International Bar Flies’. There are 14 rules for the group – one example being: ‘Remember, nothing is on the house but the roof’ – as well as a list of its first 500 chartered members (Harry is second, with his last name written as McElhone, though the family seems to have used the spelling MacElhone), and an official jingle for the organisation, Buzz-Buzz-Buzz, accompanied by sheet music and a note on its history. It’s there that we see boulevardier deployed in its classic context, to describe a man-about-town or well-to-do socialite. The word was originally used however to specifically describe ‘a frequenter of the Parisian boulevards’. Hemingway’s book was published a year prior to Barflies, and Hemingway himself had a well-known association with the Paris scene of that era, particularly including his time spent at Harry’s New York Bar. He and his character in the book were both assuredly boulevardiers. Bringing everything full circle, Gwynne – whose name is properly spelled as Erskine, including when he appears as number 27 on the IBF’s membership list – was the founder of The Boulevardier magazine. The drink was lost to the decades before the modern cocktail revival, not achieving the same sustained prominence of drinks such as the Martini or Manhattan. 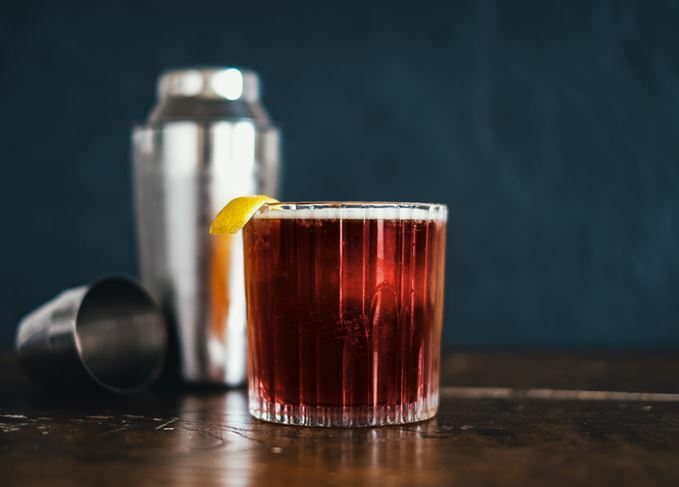 Perhaps as a result of the drink’s long dormancy, the modern Boulevardier is largely unchanged from how it first appeared in 1927, with an equal combination of Campari, sweet vermouth and Bourbon. There are two main ways to start shifting beyond the classic recipe, though. The first is a commonly seen switch to rye whiskey in place of Bourbon. ‘I would rather have rye than Bourbon, as it tastes a little drier and is better balanced,’ Varamo says. The next is tinkering with the ratio of the ingredients. For a stronger whisky backbone, dial up its presence in relation to the Campari and vermouth. Either a lemon peel or an orange peel can be used as a garnish, and less frequently, a cocktail cherry. The drink is stirred on ice and typically strained and served up in a coupe. However, it’s not unusual to see the drink offered on the rocks either. Given all of the above, there’s plenty of flexibility to craft your own preferred Boulevardier – choose your type of whisky, your preferred garnish, the ratio of the spirits, and how the drink is served. Method: Pour all ingredients into an Old Fashioned glass with ice. Stir gently. Garnish with an expressed orange peel. *Place whole coffee beans in any jar or non-reactive container, cover with Benedictine and leave for 12 hours or overnight. Create it in batches, and adjust the quantity of beans and infusion time for personal taste. Once she got tinkering though, she couldn't help but strip this cocktail to its bare foundations before rebuilding it with an entirely new floorplan. Dry vermouth is used in place of sweet, and Benedictine jumps in for Campari, with the coffee beans providing bitterness which might otherwise be lacking. Orange bitters and an orange garnish tie everything together, while livening up the dry vermouth and playing nicely off the coffee.